We are pleased to welcome you to our Society and we hope that you find something of interest here. Heritage is about passing things onward (to the future) and we would appreciate your letting people know we are here (trying to record the heritage of the Maldens and Coombe area). 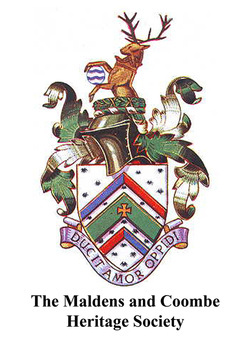 Initially, there may be an unintended bias towards New Malden but we welcome any information on Old Malden and, of course, Coombe. Those of you in these parts of the old borough please don't feel left out and please please contribute to ensure we cover all three areas. Browse through the Archive for old photos, documents, papers etc, please read the various articles under Publications & Papers and please do contact us as we'd love to hear from you! Please see the link to the Meetings Schedule as we warmly invite you to attend our meetings.